Driving home through the woods recently in the dark, this mangled product of alien in-breeding stumbled across the road in front of me. 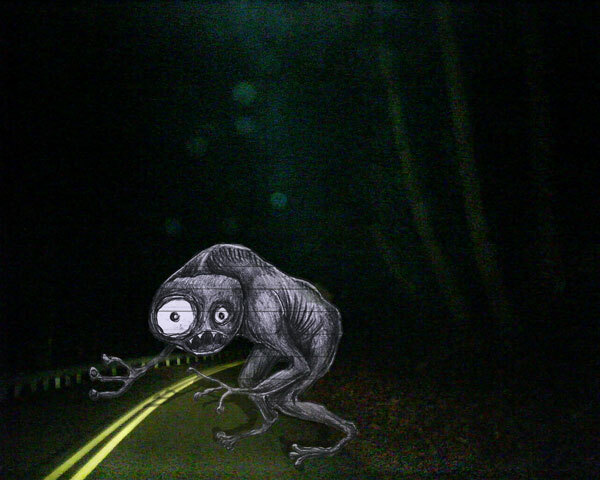 I can’t stand when creatures stumble out of the woods at the periphery of my headlight wash — it scares the hell out of me. For weeks, you’ll always think something is there, in the woods, watching, stumbling. This entry was posted in alien, creature, driving, scary, woods. Bookmark the permalink.